“Renewing Christian Anthropology in Terms of Kashmir Shaivism”. Rev. Dr. John Dupuche was Pastor of Nazareth Parish, Ricketts Point, Melbourne. He is senior lecturer at the University of Divinity, and Honorary Fellow at the Australian Catholic University, and chair of the Catholic Interfaith Committee of the Archdiocese. He has a doctorate in Sanskrit, specialising in Kashmir Shaivism and is particularly interested in its interface with Christianity. His book Abhinavagupta: the Kula Ritual as Elaborated in Chapter 29 of the Tantrāloka was published in 2003; Jesus, the Mantra of God in 2005, Towards a Christian Tantra in 2009. He has written many articles in these fields. The first generations of Christians moved out of the Jewish framework into the thought-world of the Greeks and reinterpreted their faith in a new way. Now with the end of the colonial era, where the East was interesting only if it was exotic, we are witnessing a massive new shift. Rahner’s comment to Bettina Bäumer reflects his awareness that the Hindu thought must profoundly affect Christian theology, making Christians qualify categories and images that are so familiar as to be unquestioned. Christian anthropology, as presently understood, is profoundly dualistic: God and man, heaven and earth, nature and grace, faith and reason, Church and State, sin and grace, good and evil etc. But St Paul says: “all are one in Christ Jesus”. New anthropologies are needed. The method of this paper is to present some aspects of Indian and Christian thought. I will weave between Christianity and Kashmir Shaivism ending not with syncretism but reinterpretation. I will speak of consciousness in place of the word ‘God’, of emanation in place of creation, of ignorance in place of sin, recognition in place of redemption, of identity instead of faith, of universal bliss instead of eternal life. These pairs of terms – consciousness / God etc. – are not deemed to be equivalent. Neither are they being compared but only connected. What light can one throw on the other? What questions are posed? Can the Christian experience be expounded – not falsely – in these terms, given, as we know, that Christian vocabulary cannot adequately express Christian experience? Can these Sanskrit terms become the vehicle for a theology which leads to the knowledge of the Christ who exceeds all that can be said of him? This attempt will be the beginnings of a Shaiva Christianity or a Christian Shaivism. In the Shaivism of Kashmir, consciousness, also called ‘Śiva’, is pure awareness without any object of awareness. However, consciousness is not ignorant of itself. Awareness is self-aware not dividedly but identically. This auto-illumination of consciousness is the Supreme Word (paravāc) and is expressed as “I am” (aham). This consciousness is not the impersonal Brahma as in the famous phrase “Thou art That” (tat-tvam-asi) which is found in the reflections of Raimon Panikkar. Rather, in Kashmir Shaivism the ultimate reality is supremely personal but not individual, always Subject and never object. a. Like the mirror which can reflect any object precisely because it does not necessarily portray any particular object, so too the Supreme Word contains every expression and is limited to none. Out of freedom (svātantrya), indeed out of a sense of play (līlā) the Word is expressed in the multiplicity of the universe. This universe is therefore the expression of Consciousness who both transcends the expression and is the expression; just as the dancer is the stance he adopts and is not confined to that stance. Śiva is his work, yet at the same time transcends his work. 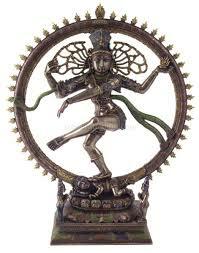 The universe is the dance of Śiva Naṭarāja (‘Lord of the Dance’). This dance is at the same time emanation (sṛṣṭi), maintenance (stithi) and dissolution (saṁhāra) since all is flux and change in this vibrating universe. b. A few words now, on the Judeo-Christian idea of creation, which may at first seem totally different from the Hindu view. The Hebrew word ōlām first meant both heaven and earth. It is only in later Hebrew that it came to mean the ‘world’. The Greek word kosmos, for its part, refers to the order of the universe formed out of pre-existent chaos. The Septuagint, therefore, in choosing the word kosmos to translate the Hebrew ōlām colours the meaning of this latter term. The term kosmos occurs most frequently in the Johannine writings, some 105 times, which is two and a half times more frequently than in the rest of the New Testament. It can have a quite neutral meaning in itself although it is full of possibility because the kosmos proceeds from the logos and is essentially linked to it. The word kosmos can also have a positive meaning because God loves the world. Later in the Gospel it acquires a negative meaning when the world is seen as hostile to Jesus. c. It is against this Greek view of kosmos formed out of chaos that Athanasius teaches the doctrine of creatio ex nihilo. This Athanasian view has become dominant even though an emanationist interpretation of creation is available in the neo-Platonic Christian tradition. The seeming opposition between Hindu emanation and Athanasian creation may not, however, be insuperable. In Hindu thought there is a distinction between the expresser and the expression but not a separation. The term ‘mantra’ can refer both to the deity and to the phonic expression of that deity, to the reciter and to the mantra she recites. The speaker both transcends her word and is her word. When the speaker fully communicates herself, she and her word are not dual but identical, distinct but not divided. The one leads to the other; the one is the other and, even if our minds construct a separation, in reality there is none. The analogue for understanding the formation of the world, therefore, can be the dancer or the poet or prophet rather than the architect. Indeed, the first account in Genesis sees creation as a prophetic act. God is his word and transcends his word. But word is work and work is word. The work of creation is God and is not God. This is all the more true in the Indian philosophical system, which is based on the word rather than on objective reality, on revelation rather than on being (esse). However, the expression is also a limitation. The emanation of the world is both an expression of the divine Light (prakāśa) and a concealment (tirodhāna) of that Light which continues to diminish until it reaches the state of inertia (jaḍatā), just as the ripples in the pond eventually peter out. Thus Śiva delights to be his opposite, consciousness being reduced to ignorance, light being completely obscured. The human being who does not understand these things sees herself as merely human. The individual says: ‘I am this person and not that person. I am such and not otherwise.’ This divisive attitude is an error, an ignorance (avidyā), which is not a lack of information but an absence of wisdom. It is even a lie, since in the depths of one’s being the truth is always known. This failure to understand is the primary fault or stain (mala) confusing the individual self (ahaṁkāra) with the universal Self (aham), either to inflate the importance of the individual self or to reduce the universal self to the human level. It is said, in classical Catholic moral theology, that for a sin, either of commission or omission, to be perpetrated there must be sinful matter, knowledge and consent. The sin is grave if all three elements are grave and full; the sin is venial if one of the elements is partial. Knowledge would seem, therefore, to be a constituent part of the sinful act. However, there are many texts in the Gospel which also describe sin as ignorance. Not only the famous ‘Father, forgive them; they do not know not what they are doing’ (Lk 23.34 ), but also: ‘Blind? If you were, you would not be guilty, but since you say, “We see”, your guilt remains.’(Jn 9.41) Or again: ‘The [servant] who did not known [what his master wants], but deserves to be beaten for what he has done, will receive fewer strokes.’ (Lk 12.48) The ‘strokes of the lash’ are given, even though there is no conscious act of disobedience. Ignorance (avidyā) in Kashmir Shaivism is a failure to know the truth; an absence of enlightenment which means that the individual cannot but perform acts which are disastrous both personally and for others. Revelation is not only concerning the good but also concerning the true nature of evil. The acknowledgment of the Self (aham) does not involve the elimination of the individual self (ahaṁkāra). Absorption (saṁhāra) does not mean annihilation but reinterpretation: understanding that the limited self is an expression of the true self and that one is really “I am”. It is extremely difficult to cease identifying with the individual self. Indeed, in Scriptural terms it is a ‘dying to oneself’. This is more than the elimination of unrighteous thoughts and actions, the abandonment of selfishness. It is a fundamental change of perception, a rebirth, and regeneration. Even if the soul is declared to be immortal it is not absolute and does not necessarily exist. It could, if God so willed, simply cease to exist. No ultimate reliance can be placed upon the soul or the will. The individual self is indeed real and not imaginary, but is essentially contingent and in this sense profoundly unreal. Only God is truly real. This ignorance leads to acts that are absurd and divisive, bearing a harvest of unfortunate consequences (karma), which may take lifetimes to redress. The purpose of the teachings of Kashmir Shaivism is to lead the disciple to the act of recognition (pratyabhijñā) where he recognises his essential truth and concomitantly understands the relative nature of his individual self. He comes to see that his individual self is essentially an expression of the divine self and that his essential reality is divine. St Paul puts it perfectly: “I live now not with my own life but with the life of Christ who lives in me.” According to Kashmir Shaivism, the saving moment is essentially a change of perception. The practitioner turns away from idolising all limited things and recognises the essential nature of reality. This dying to oneself is not just a moral attitude, but also a profound change of perception, a new ontology. The individual self ceases to be the centre of focus and is reabsorbed into its origin. If faith implies devotion, and if devotion is understood to mean separation, there is no place for that sort of faith in Kashmir Shaivism. If, however, faith implies identity (tādātmya) then Kashmir Shaivism is profoundly concerned with faith, for its aim is to acquire identity with Śiva, indeed to attain the very state of Śiva (śivatā). It is a resting; not in a separate self but in one’s own true self (sva-ātma-viśrantī) identified with the divine Self. The act of recognition leads to the divine state which is not self-absorption but universal bliss (jagad-ānanda); a state beyond action (kalpa) and thought (vikalpa), a state transcending thought (nirvikalpa) and which all thoughts and actions only partially express. The practitioner is not aloof from the world but fully present. The panoply is not something apart from her but is indeed her very self, the expression of her own being, and is therefore welcomed as she welcomes her own self. This is the ‘attitude of Bhairava’ (bhairava-mudrā), where, if the meditator looks within, into his own heart, he sees the whole world; if he opens his eyes and looks upon the world, he sees himself, for the world and he are one. Whether the eyes are open or shut he sees the same. His eyes are both open and shut, for he is in the world as in his own body but not defined by it. It is not a state available only after death but can be achieved in time. The practitioner is liberated while alive (jīvan-mukta), so that his every word is mantra and his every act is ritual. In order to achieve that result, Kashmir Shaivism proposes four means (upāya), which are based on four forms of knowledge. b. The four means (upāya), which was the topic of Bettina Bäumer’s paper that so impressed Karl Rahner, are based on those four forms of knowledge and each can lead to the ‘attitude of Bhairava’. The least exalted method is based on the object, i.e. on practices that are varied according to the character of the practitioner. The next is based on the means of knowledge where, by reasoning and reflection, he comes to the act of recognition. The next focuses on the subject where the subject more directly and immediately perceives his own true nature. But that method is still imperfect because the practitioner sees himself as distinct from the means and the object of knowledge. c. The most exalted means is really a non-means (anupāya) because in fact there is no path to follow: the goal is reached suddenly and totally, due to an intense descent of energy (śakti-pāta), an immense outpouring of grace (anugraha). Nothing more is to be done; there is no need for repeated practice or deeper understanding. The practitioner who has achieved this state is not introverted. Rather, universal bliss confers universal bliss. “They have no other work to accomplish but to confer grace”. c. However, according to the thirteenth century commentator Jayaratha, the term ‘non-means’ (an-upāya) can also be understood as ‘a very reduced means’ (alpopaāya) or a ‘subsidiary means’ (parikaratvam). He lists a certain number of the reduced means. Any one of these is sufficient to bring a person to full realisation, suddenly and without any need to engage in practices to deepen the realisation. What sort of Kashmir Shaiva Christology emerges form all this? On seeing (darśana) Jesus or hearing a teaching (kathanam), the disciple experiences his own consciousness expanding. He then knows both Jesus and his own self, and indeed realises that Jesus is his own very self, for only like can see like, only the same can see the same. In fact, not only is the self of Jesus the very self of the disciple but the whole world too is an expression of the one Self. In short, the sight and teaching of Jesus are examples of the “very reduced means” (alpopāya) noted above. 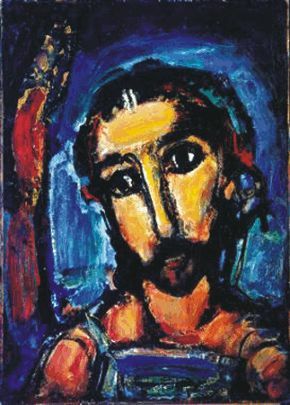 But more; in contemplating Jesus and so arriving at consciousness, the disciple penetrates to the utterly Transcendent (anuttara) so that it becomes clear to him that Jesus of Nazareth is essentially the “I am”, the Supreme Word (paravāc), the self-revelation of Consciousness. Since from that Expression all other expressions derive, Jesus looks upon the world and sees it as the expression of his self. Jesus is the Lord of the Dance. In the events of the Sacred Triduum Jesus knows both the depths and the height; knowing good and evil, able to descend lower than any because he knows the height. The Paschal Mystery is the moment of supreme revelation. Although the Word of God has been revealed in various ways since the dawn of time, the Word incarnate is best able to reveal to flesh, since flesh needs flesh. Flesh best reveals flesh to itself. In the fullness of his living and dying he is the perfect expression of heaven and earth. Jesus, therefore, is able to provide the knowledge, which leads to the utterly Transcendent (anuttara). He is the Light that brings all to Light. The Word made flesh makes all flesh Word. All is non-dual (a-dvaita). All is one. Abhinavagupta Tantrāloka with the Commentary of Jayaratha. Re-edited by R.C. Dwivedi and Navjivan Rastogi, enlarged with an introduction by Navjivan Rastogi and reprinted in 8 volumes. Delhi, Motilal Banarsidass, 1987. Bettina Bäumer ‘The Four Spiritual Ways (upāya) in the Kashmir Saiva Tradition’ in Regional Spiritualities, pp. 3-22. Brown, Raymond The Gospel according to John. New York: Doubleday and Company Inc. 1966, Vol.1; 1970, Vol.2. Cassem, N.H. “A Grammatical and Contextual Inventory of the use of kosmos in the Johannine Corpus with some Implications for a Johannine Cosmic Theology,” in NTS 19 (1972-1973) 81-91.
translated by Nicholas Gendle, preface by Jaroslav Pelikan. London: SPCK, 1983. Mansions., Maryknoll, New York: Orbis Books, 2002. pp.121-144. Pettersen, Alvyn Athanasius and the Human Body, Bristol: The Bristol Press, 1990. Tracy, David Dialogue with the Other; The inter-religious Dialogue. Louvain: Peeters Press, 1990. Prof. Dr. Bettina Bäumer, Institute of Religious Studies, University of Vienna. Personal communication, 9 April 2004. Cardinal Ratzinger, in the recent ad limina visit of the Australian Catholic Bishops, “spoke of the need for the Church to present a Christian anthropology which opens out to the world a deeper understanding of the human condition …. A positive vision of what it means to be a human being…’Letter of Archbishop Hart, dated 1 April 2004, to all priests of the Archdiocese. David Tracy, Dialogue with the Other; The inter-religious Dialogue. Louvain: Peeters Press, 1990. p.94. Raymond Brown, The Gospel according to John. New York: Doubleday and Company Inc. 1966, Vol.1, p. 508. N.H. Cassem, “A Grammatical and Contextual Inventory of the use of kosmos in the Johannine Corpus with some Implications for a Johannine Cosmic Theology,” NTS 19 (1972-1973) 81. Jn. 3.16. See also Jn 11.9 ; 17.5, 24; 21.25. Brown, The Gospel according to John. Vol.1, p.25. Jn 1.29; 3.16; 4.42; 6.51; 8.12; 9.5. See 12.31; 14.17, 22, 27, 30; 15.18-19; 16. 8, 11, 20, 33; 17.6, 9, 14-16. Alvyn Pettersen, Athanasius and the Human Body, Bristol: The Bristol Press, 1990. p. 5. Tracy, Dialogue with the Other. p.86. Jacques Dupuis, Christanity and the Religions. Maryknoll: New York, Orbis Books, 2002. p.123. Ecumenical Council Lateran V, Bull “Apostolici regiminis”. In Denzinger H and Schönmetzer A. Enchiridion Symbolorum, no.1440. Freiburg im Breisgau: Herder, 1967. p.353. Raimon Panikkar, “On Christian identity” in Cornille, Catherine (ed.) Many Mansions, Maryknoll, New York: Orbis Books, 2002. p.139. This is a commonplace of Hindu thought. This is fourth in the listing but in fact underlies all three separate forms. This notion of light seeing its light by means of its own light is found in the theology of Gregory Palamas, the last of the Greek Doctors of the Church. He makes a very striking analogy with the eye. After referring to St Paul (II Cor.12.2) he pictures a sun of infinite radiance and size – at the centre of which all stands but now transformed into an eye. Paul, like that eye, is in light and seeing light. There are no limits. “If [the visual faculty] looks at itself it sees light; if it looks at the object of its sight that is also light; and if it looks at the means it uses to see, that too is light; that is what union is: let all that be one.” Triads, II.3.36. London: SPCK, 1983. p. 66. “(In this method śāmbhavupāya there is still) a conception of a difference between method and goal (upāya-upeya-kalpanā), whereas (in the case of anupāya) there is not even a trace of any difference. For in the non-way, who is to be liberated, how and from what?” TĀ 3.272-273. Bettina Bäumer, ‘The Four Spiritual Ways (upāya) in the Kashmir Śaiva Tradition’ in Regional Spiritualities, pp.17-18. Tantrāloka vol.2. p.312, line 13. Tantrāloka vol.2, p.312 lines 13-14. This entry was posted in Christian tantra, Hindu Christian relations, Interreligious dialogue, Interreligious dialogue, Melbourne, Kashmir Shaivism. Bookmark the permalink. Its evident what ur attempting.. ur struck by hindu philosophy but ur ego doesnt allow to shove christianity. In turn, u want to appropriate hindu thoughts to satisfy ur identity crisis. Jesus was a great yogi, no doubt about that. But ur attempts at preserving ur identity is less effective in spiritual path. There is no need to bring out a justifiable theology out of syncretism and place jesus at the top. Its just ur mind playing little games with u.. The message of jesus to serve humanity like u would serve urself is enough for a believer to reach the truth. But the more u try to bring in separation, bias and favouritism, ur still in the loop. Loose ur affliations , identity and kill ur ego in christ( since ur a beleiver) to discover urself. U can try fooling urself into believing that grace alone is enough..! But ask urself again..Have u shred away the last drop of ur ego..? ?